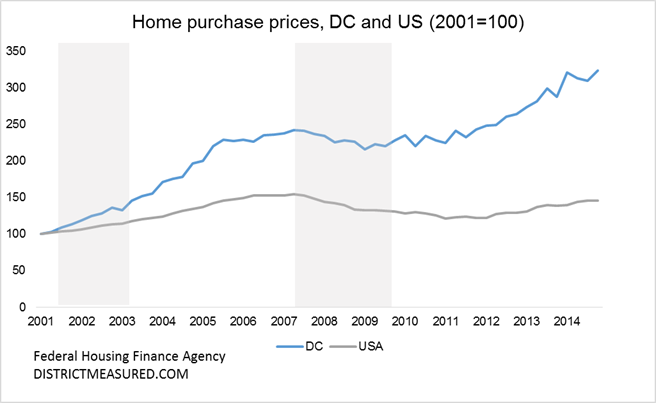 In 2014, according to data compiled by the Federal Housing Finance Agency on home purchase prices, homes in the District sold for over three times the prices they commanded in 2001. During that time, home prices in the U.S. also increased, but not nearly as fast—2014 prices were 45 percent greater than 2001 prices. 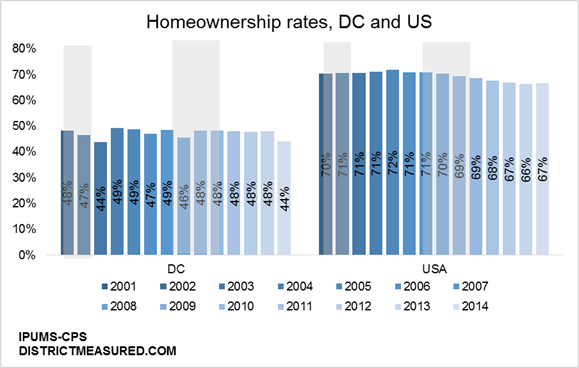 The great recession did dampen prices in the District (shaded in the graphs below), but not enough to undo the rapid gains in early 2000s and since the end of the recession, rapid price increases once again became the norm. So how did all this affect homeownership? In 2014, 44 percent of District residents lived in homes they owned—that is down 4 percentage points from 2001 and down five percentage points from 2007 (right before the great recession) when ownership rates reached 49 percent. As a relative decline, this is about 10 percent (5 out of 49). Homeownership rates declined in the US too, but not as rapidly. Ownership rates declined by 4 percentage points since the beginning of the great recession from 71 percent to 67 percent, but given that ownership rates in the nation were much higher to begin with, this is a relative decline of 6 percent. We have written many times on this blog about the changing demographics and gentrification in the District (see here, here and here). Homeownership lies at the heart of these issues. So we checked: how did home ownership change among different income groups? We divide the District’s resident population into three groups: low-income, which includes all households with incomes in the bottom 25 percent of the income distribution in 2014, high-income, which include households in the top 25 percent of the distribution, and middle-income, which is all the households in between. We look at these groups since 2001, adjusting income thresholds for inflation. This way, we are comparing similar groups based on today’s demographics. In 2014, 19 percent of households who fall in the bottom 25 percent of the income distribution owned their homes. If we looked at the same income group in 2001, we would have seen that 31 percent of them owned their homes. That is a relative decline of 40 percent. Homeownership among the middle-income groups increased through the 2000s, only to go back to their 2001 levels in 2014, at 43 percent. Homeownership among high income residents also lost ground, but only slightly, going down from 77 percent to 72 percent. There are many issues at play here: increasing prices, transient population, limited growth in housing stock, demographic change (read: more singles who are less likely to own across all income groups and overall growth in population). 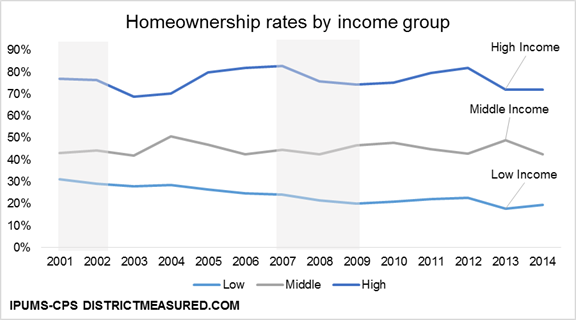 But what is clear is that the income composition of homeownership is changing, with ownership of housing shifting towards middle and high income residents. What exactly is this data? The home price data is the quarterly index of home prices based on estimated purchase price. Homeownership and income data are extracts from the Current Population Survey data maintained by Miriam King, Steven Ruggles, J. Trent Alexander, Sarah Flood, Katie Genadek, Matthew B. Schroeder, Brandon Trampe, and Rebecca Vick. Integrated Public Use Microdata Series, Current Population Survey: Version 3.0. [Machine-readable database]. Minneapolis: University of Minnesota, 2010. Next > Income differences among spouses in the District are still significant.